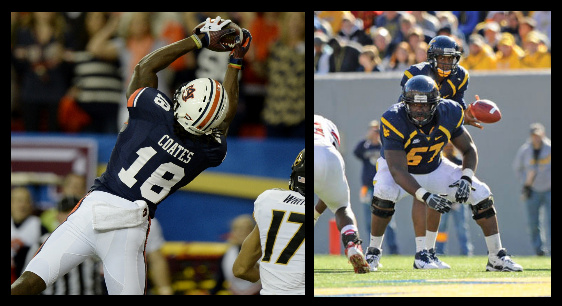 The Pittsburgh Steelers continue their preparations leading up to the 2015 NFL Draft later this month and are reportedly hosting two more prospects on Monday of next week – receiver Sammie Coates of Auburn and offensive lineman Quinton Spain of West Virginia. Coates put together a good 2014 season with the Tigers as a wideout. A three-year starter, Coates had seven career 100-yard games and was named second team all-SEC (coaches, AP, Phil Steele). Coates finished tenth in career receiving at Auburn with 1,757 yards and 13 touchdown receptions. Coats is nearly 6-foot-2, 212 pounds and averaged 21.4 yards on 82 career catches. Although he was a deep-threat receiver at Auburn, many NFL scouts wonder if he can compete at that level against pros. Coates insists that he can, but will need to show that he can do more than take the top off of NFL defenses to earn a place on the Steelers’ draft board. Spain in a big guard projected to be a late-round draft selection. He is athletic and has the ability to get off of the snap and attack. At 6-foot-4, 332 pounds, Spain surprised many with his ability to cover short-area movements yet secure a block and push it into the second level, especially in the zone. With strong leg drive, his wide base and length added to his aggressive nature on the field would give the Steelers depth at not only the guard position but along the interior line. The area of concern for Spain is his inconsistency using his hands. Spain has shown a tendency to not utilize the full length of his arms to get a solid hit inside the frame of defenders and will need to work on getting inside the shoulders. Mike Munchak could tutor this kid into a nice addition. Spain put up the following Pro Day results: 40-yard dash: 5.04 and 5.02 seconds; Vertical jump: 29 inches; Broad jump: 8 feet, 7 inches; Bench press: 28 reps of 225 pounds. Spain was a 2013 and 2014 All-Big 12 honorable mention. 1 Comment on "Sammie Coates, Quinton Spain scheduled to meet with Steelers"
I like the Steelers approach here. I know next to nothing about these prospects (Clear, Coates, Spain), but the team seems to be looking for developmental talent rather than trying to find plug-and-play starters. That is a characteristic of the better NFL teams: they groom (develop) athletes to fit their system. In that regard, in addition to the draft prospects, we should not forget the seldom discussed stealth talent already on the roster, like LBs Jordan Zumwalt and Shayon Greene, S Isaiah Lewis, DEs Geathers and Konrath, and TE Michael Egnew. Some of these guys may not make the squad, but some of them are going to step up and fill roles for us. Our ability to turn men with raw talent into NFL-ready warriors will determine our success in 2015 as much, if not more, than our draft class. What I don’t see on our roster is an CB with the physical skills to become an All-Pro; we are making do now with back-up talent at that position. Which is why I expect the Steelers to draft a CB very high or to find a veteran CB after the draft who is better than Gay or C. Allen in man-to-man coverage.